When I pack up a pen that I’ve worked hard on, and send it out the door to a new home, a little bit of me goes with that package. I’ve invested time, energy, creativity, and artistry into making a quality writing instrument that I hope will give you pleasure for years to come. It’s rather like sending a child to the first day of school. I worry a bit about how it will fare as it travels into unknown territory, and how it will be received as it crosses the threshold to its new home. I do everything I can to prepare it well at each stage of creation, testing the fit of each part carefully before moving on to the next. However, once a pen is polished and washed and all shiny and sparkly, the work is still not complete. The next step is just as important as the pen crafting itself. That’s when I test and tune the new nib to make sure it has proper flow and writes as smoothly as possible. I now have a desk in my studio dedicated solely to this final stage of pen preparation, with all my tools in one place, in easy reach. 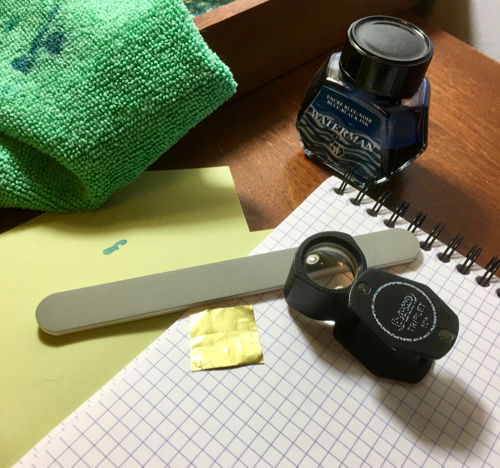 I love to sit down there and concentrate on a nib, examining it with my loupe, working on the tines to align them, using a buffing stick or lapping film as needed to create a smooth writing experience. While I make no claim at being a Nibmeister, I can at least ensure that my nibs perform optimally. After I make that final pass on a Rhodia pad, and the Waterman Blue-Black ink glides smoothly across the paper, a smile comes over my face, and I know that’s it, the nib is good to go. I flush the nib thoroughly until the water is as clear as possible, and then prepare it for shipping. If you notice a hint of mysterious blue ink still in your new pen when it arrives, this is why. Your pen and I then move to the Shipping Room (once known as the living room) and assemble the parts for final packing. Each pen is slipped inside a soft, velveteen drawstring bag and then placed in a sturdy, durable, and reusable telescopic PVC tube with cushioning on both ends of the tube. Accompanying your pen into the shipping box is a little “Thank You” folder that I’ve assembled. 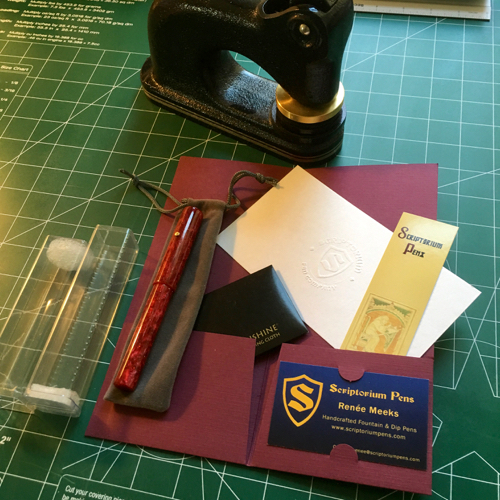 It contains a Scriptorium Pens bookmark, a sheet of blotter paper with the Scriptorium Pens logo embossed in the center, a business card, and a Sunshine Polishing Cloth for your pen’s gold, silver, bronze, brass, or copper accents. Into the box it all goes, and that’s the last I’ll ever see of that pen, most likely. I’ll have done all I could to prepare it for its new home, and with more than a little pride I’ll send it off, and like an anxious parent, wait for word of how it is received. And I do get word, whether via email or traditional, written letter, and I cherish each one. Some offer just a few words, while others are more expansive, relating how smoothly the pen writes, or how it feels in the hand, or how much enjoyment it brings just by gazing at it. Sometimes the letters are more personal and moving, of how the pen was chosen to mark a special moment in the recipient’s life — a graduation, a promotion, a new birth – or how the pen arrived at the end of a very long and frustrating day when a special pick-me-up was desperately needed. It’s a humbling experience to know that my pens can mean so much to others, and a constant reminder of my responsibility, as an artist, to make sure my work meets the highest levels of quality that I can invest it with. So yes, what’s in the box is a little bit of me in each and every pen. A little creation story, with a new life being handed over to start more stories. What will that next story be? Thank you for letting me know how much love and care you put into your pens! It is good to know that there are still artisans out there who produce a fabulous product. You are great!! !